We’re enjoying the last few days of summer! On these hot days, it can be tempting to reach for a soft drink or other sugary beverage, but the empty calories and excess sugar can lead to poor nutrition and unwanted weight gain. Choose water for the healthiest hydration with no added calories. It’s time to rethink your drink! For a treat, mix 100% real juice of your choice with seltzer for a lower-calorie, healthy alternative. 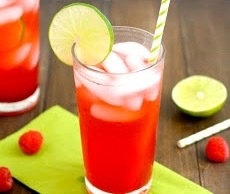 Try this refreshing raspberry sparkler with lime. Combine fruit juice, lime juice and sparkling water. Stir to combine. Divide evenly between four glasses and garnish with lime wedges and mint. Serve over ice with a fun straw. Gardening can be inspirational, and these young poets agree! 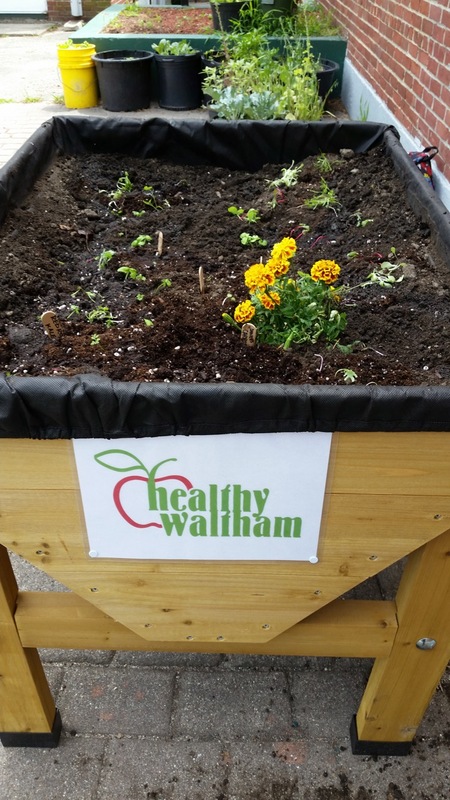 This summer, Healthy Waltham held gardening clubs at Chesterbrook, Dana Court, and Prospect Hill Terrace housing communities. 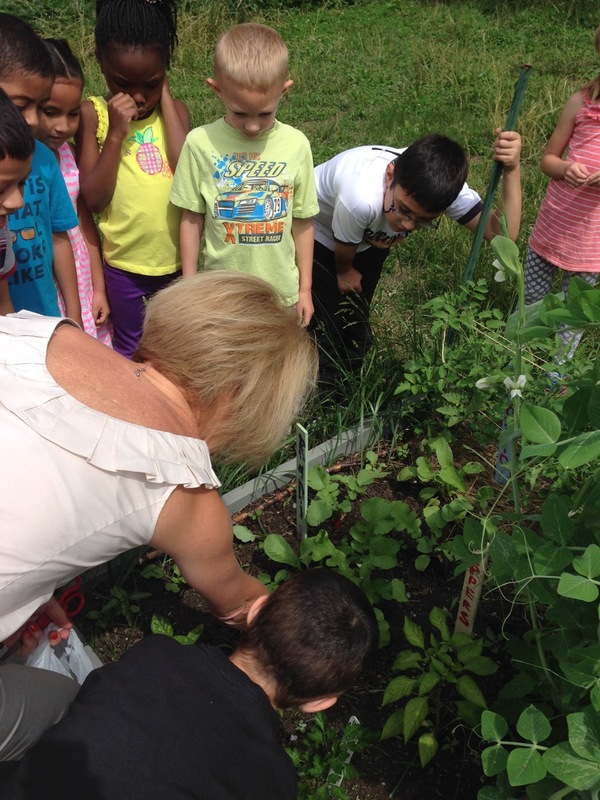 One warm day, students from our summer garden club at Chesterbrook took a break from gardening to write poems inspired by nature, vegetables and flowers. Thanks to all who helped out or attended the summer gardening clubs this year, especially our summer interns Liz and Soumya, and a special thank you to our Board President, Dr. Nadene Stein, for leading the club at Chesterbrook and for leading the kids in writing poems about gardening. See some photos from the gardening clubs here. Enjoy the poetry from our gardening poets! Is sweet, fun to grow and watch. Sometimes taste sour or sweet. Green flower, hairy leaf, great! It is a delicious snack. How often do people in Waltham eat healthy foods? What are some of the reasons people may not eat healthy foods? These are a few of the questions that the Waltham Healthy Food Access Coalition is addressing in a community-wide survey. We need your help if you live, work or go to school in Waltham! The Waltham Healthy Food Access Survey was designed to gather information from the entire community about the challenges we face in making healthy food decisions. Once we have a better picture of the most important factors in the Waltham community, we can take action steps in policy advocacy, education, and programming to better address these issues, ultimately making the healthy choice the easy choice for all. The more responses we can gather, the more accurate our picture will be. We want to make sure that all voices are heard and that everyone’s needs are considered. The survey consists of 15 questions and you can complete it online by clicking on one of the survey links below. It’s easy to participate! Thank you very much for your participation in the Waltham Healthy Food Access Survey! Questions about the survey? Send an email to reva@healthy-waltham.org. 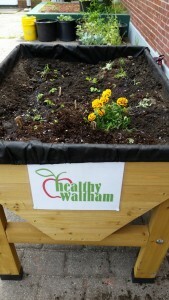 Healthy Waltham started the Stanley Elementary School garden back in 2008. We are very fortunate to have amazing volunteers like Tammy Donroe Inman who has become caretaker of this garden and organizes families to maintain it over the summer! She recently wrote this piece for us. This is why we garden. 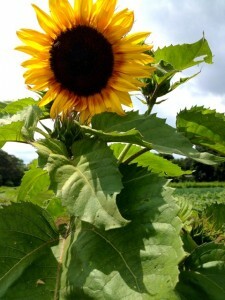 Be sure to check out Tammy’s blog www.foodonthefood.com. These were words I never thought I’d hear from a group of 6- and 7-year-olds. Yet there they were, a gaggle of first graders from Cathy Collins’ class not only picking the brightly colored Easter egg radishes from the ground and holding them under a watering can to wash them off, but waiting rather impatiently while I sliced them into enough rounds for everyone to taste. “This one’s pretty spicy,” I said, separating it from the milder-tasting ones. “I love spicy things!” one precocious student replied. I was skeptical, but a brave group of four boys and two girls insisted that only the spiciest radishes would do. I sliced them thinly just in case. They devoured them instantly and asked for more. Such is the scene at the William F. Stanley Elementary School as teachers, their students, and I (a parent volunteer) come together to plant a garden that the whole school can share. Kristen Amarante’s second grade class recently came out to plant two varieties of pumpkins, a small, sweet pie pumpkin and a large jack-o’-lantern type called Big Max. Kim Cox’s third graders planted sugar snap peas in May, as well as a self-supporting wooden teepee out of sticks and twine on which the vines climb skyward. Patty Cummings’ kindergarteners planted carrots and those beautiful radishes we were sampling. Mrs. Collins’ first graders planted sunflowers and the neighborhood Daisy Troop sowed nasturtium seeds, a pretty (and edible) flower. The Stanley garden was created seven years ago by Healthy Waltham, a local non-profit organization that promotes healthy eating and an active lifestyle. They had received a grant from the Massachusetts Department of Public Health (and later, the American Heart Association and Whole Kids Foundation) to establish and maintain gardens at the city’s public schools. The goal was to encourage an understanding of where our food comes from and provide local access to fresh, healthy fruits and vegetables. Healthy Waltham provided seeds, supplies, and general organic gardening expertise, particularly from certified Master Urban Gardeners Judy Fallows (who now runs the elementary school gardens for the City of Watertown) and Louise Forrest (formerly of Cambridge’s CitySprouts). The Stanley garden started small—so small that few even knew it existed—but its south-facing location proved a prolific spot for heat-loving tomatoes, peppers, and eggplants. Gradually, it expanded with plantings of rhubarb, Concord grapes, cherry trees, and perennial flowers like daylilies, irises, and peonies. Seeing this beautiful garden take shape inspired me to get involved five years ago, along with now-retired school librarian Laura Larsson. Together with Healthy Waltham, we added a strawberry bed and a butterfly garden filled with native flowers to attract pollinators. I learned a lot about gardening during that time. But then, last year, the government funding was cut. The garden at Stanley was in danger of being abandoned. But having seen firsthand how excited the students were to get outside, plant things, and watch them grow, I offered to continue the planning, planting, and general maintenance of the garden on a volunteer basis. The parent-teacher organization had already approved a budget for supplies like compost, hay, mulch, seeds, and tools. Parents and teachers donated materials from their basements. Children painted signs. I scavenged a rusty wheelbarrow from someone’s trash. Now the garden is entirely self-supported. We’re growing lettuce, Swiss chard, collard greens, kale, cabbage, broccoli, cauliflower, Brussels sprouts, peas, green beans, garlic, onions, tomatoes, peppers, eggplant, corn, cucumbers, squash, tomatillos, husk cherries, three kinds of melon, flowers, and most of the herbs you see at the grocery store. The garden has tripled its original size. It has occurred to me over the years that there are innumerable learning opportunities that can take place in a garden environment. Interest in the natural world and environmental stewardship is an important one: in the past two weeks, students and I have spied wild turkeys and rabbits on the ground, and red-tailed hawks, great blue herons, turkey vultures, and a bald eagle in the sky. We’ve observed several different types of butterflies, including painted ladies, black swallowtails, and cabbage whites, not to mention worms, grasshoppers, dragonflies, and ladybugs. Praying mantises are particularly popular. But I’m also talking about core curriculum learning. The science of how a seed grows is the most obvious connection, but there is also the science of decomposition, which is equally important. Linda Hanley brought out her fifth graders to talk about composting, and then they collected the leftover fruit scraps from snack time and added them to the compost bin. The more composting we do ourselves, the less waste we have, the less money we spend on compost, and the more food we can grow. The garden is also a great place to reinforce math concepts like area and perimeter. How much fencing do we need to protect this garden bed from rabbits? How much compost do we need to cover the existing soil by one inch? These are real questions I have that the kids can solve and make an important contribution. This year’s experiment is a Three Sisters Garden. This traditional Native American technique involves planting corn, beans, and squash all together on mounds rather than separately in rows. The plants provide mutually beneficial growing conditions for each other as well as complementing each other nutritionally. As the bean plants grow, they look for something to climb. The tall corn provides the beans with a built-in, living trellis for support while the low-growing squash vines provide shade and help suppress weeds. The beans, in turn, help fix nitrogen in the soil for the corn. Once I got the corn started, first graders from John Rita’s, Jeanne Cronin’s, and Lauren Palkey’s classes planted the green beans and several varieties of squash (acorn, kabocha, delicata, and butternut). Will a Three Sisters Garden work as well for us as it did in 1621 when the Wampanoags assisted the Pilgrims toward their first successful American harvest? Check back in the fall, but the exercise has important cultural significance, especially around Thanksgiving, and ties in well with the social studies curriculum. Summer vacation can be a tough time for a school garden. We need to keep the garden growing through July and August so the returning students can see the progress of their plants in the fall. It gets parched back there, and the deer seem to believe the garden is their own personal all-you-can-eat buffet. Luckily, nearly two-dozen Stanley families are pitching in to help keep the garden watered and maintained. The food that’s harvested will be shared with volunteers, classrooms, and the school cafeteria, which is happy to incorporate bumper crops of cucumbers and tomatoes into salads, basil into sauces. Of course, not all of the garden’s bounty is received with as much enthusiasm as those radishes were. We’re talking about kids after all. Brussels sprouts and cauliflower are still a tough sell. It can take many tries before a particular flavor or texture wins a child over, but the more exposure they have, the better the chance they’ll acquire a taste for healthy foods. Here’s another secret about kids: they’re almost always willing to try something that they themselves have planted and watched grow. There’s pride in that kind of accomplishment. For me, just seeing the look of joyful surprise on the face of a child who tried his or her very first cherry tomato—and liked it—makes it all worthwhile. Tammy Donroe Inman is a Waltham resident, mom of two boys at Stanley and McDevitt, and the author of WINTERSWEET: Seasonal Desserts to Warm the Home. She blogs at www.foodonthefood.com. Try these “grape leaf style” collards stuffed with bulgur, scallions, parsley, dill and lemon juice for a new twist on a traditional recipe. Hearty and healthy, these are perfect for a summer evening. Healthy Waltham will be handing out samples of this yummy dish at the Waltham Fields Outreach Market on August 4 from 4:30-6:30 PM, at the intersection of Cherry and Crescent Streets, Waltham. Held on Tuesday evenings in the summer and fall, the Outreach Market is a way for low-income residents to purchase fresh local produce at a reduced cost. Learn more about the Waltham Fields Outreach Market here. We look forward to showing customers creative new ways to prepare vegetables at the market! Combine bulgur with 3 cups of boiling water in a small bowl or container. Cover tightly with foil or lid. Meanwhile, slice scallions thinly using white and green parts and chop dill and parsley. 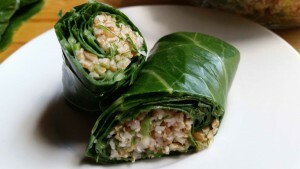 Uncover bulgur slightly, stir in remaining ingredients except collard greens and cover again. Let sit, stirring occasionally, until all liquid is absorbed and bulgur has expanded and is tender. Add more water if it has all absorbed and bulgur is still hard. Drain excess liquid if bulgur is tender and some liquid remains. Remove stems of collard greens with a sharp knife cutting a V-shape along the stem so the leaf remains mostly whole. Bring a large pot of salted water to a boil. Add leaves to the water a few at a time and cook until tender but not mushy, 3-5 minutes. You may need to stir occasionally to keep leaves under water. Stack leaves as they are cooked. Taste the bulgur mixture once the bulgur is tender and adjust seasoning to taste. Lay one collard leaf on a flat surface, overlapping ends where stem was removed to cover hole. Lay another leaf upside-down on top of the first leaf with ends overlapping on the opposite side. Place roughly 3 Tablespoons of bulgur mixture on the center of collard leaves. Fold the bottom edge over the bulgur and tuck both sides in. Roll tightly away from you to make a tight cigar-shape. Repeat with remaining collard leaves and rest of bulgur mixture.